4 Easy Grow Potted Patio Herbs To Grow For The Kitchen! If you love to cook, then growing a few classic potted patio herbs might just need to be in your future! Herbs are among some of the easiest plants to grow. 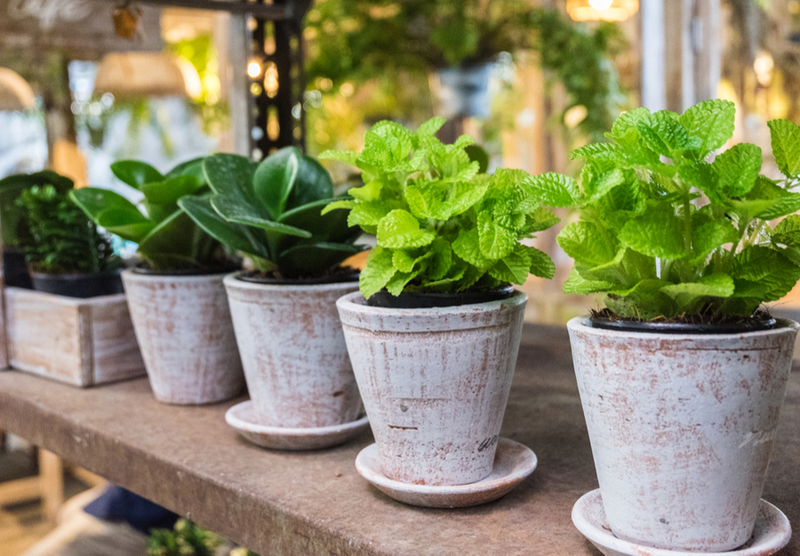 With a good potting soil mix and consistent watering, they require little to grow and thrive. And the flavor they bring to homemade dishes can take culinary skills and taste buds to new levels. Basil is one of the must grow patio herbs! The beauty of patio herbs – they are right at hand when you need them most! There is no need to trek to the garden. Just take a few steps outside, snip off what you need, and cook away. Adding to their allure, patio herbs add a touch of beauty to your outdoor living space as well. Whether it is the sweet smell of basil wafting through the air, or the wispy look of an oregano plant trailing from a planter, herbs can bring the senses alive in an outdoor setting. Here is a look at four patio herbs that can bring big flavor to your cooking this year! No home kitchen should ever be without fresh basil! Basil lends its flavors to so many different styles of cooking, from Italian to Indian cuisine, and everything in between. And just wait until you try it on some of your home-grown heirloom tomatoes with fresh mozzarella. It will leave you and your taste buds in awe! There are dozens of varieties to choose from, with sweet basil being a top choice. The leaves are wonderfully aromatic, and depending on the variety, can have tastes ranging from sweet to spicy. If you want to add a bit of color, try growing purple basil. Basil grows well in warm, sunny weather, and does extremely well in pots. You can sow seeds from early spring to late fall depending on your climate. Cilantro has become the go-to herb for all kinds of dishes. Best know originally for it’s use in salsa, fresh cilantro can be also be used in all types of dips, soups, and to flavor chicken, lamb and more. Cilantro grows extremely well in pots and planters. It grows best in more moderate temperatures. As the summer temps heat up, move it to the shadier spots of your patio to avoid bolting. Sow every few weeks in a new pot to keep a steady supply on hand. Oregano has some of the most distinct and fresh tasting leaves of any herb you will ever grow. It’s taste is one of a kind. Oregano can be grown as a perennial, so choose a large pot that can be moved into the house or garage for a little winter protection. It will come back year after year to provide great tasting flavors to all of your Italian and Greek dishes! If you have a flowerbed nearby the patio – plant it there and have it on hand year after year. Much like with all herbs, there are many varieties of Oregano. Among the two most well-known and grown are the Italian and Greek varieties. They are wonderful for flavoring everything from homemade pasta, to pizza, soups, sausage, chicken and more. Parsley is the all-purpose star of patio herbs. It can always of course be used as a garnish, but it also serves as an excellent way to flavor many salads, soups, dips and dishes. It grows best in a good, well-drained potting soil. Keep the soil moist and well watered to keep leaves at their prime. Making it even more attractive, Parsley can be harvested more than once. Remove the outer portions of leaves as needed, and the inner portions will continue to develop to be harvested soon after. One plant can be used nearly throughout a whole growing season. Have a garden tip you would like to share? How about a few photos and a story of your own garden? Use the “Feature My Garden Tip” button at the top of the website to submit your entry. Or, email us today at info@thisismygarden.com to share! This article may contain affiliate links. Worm Castings – The Perfect All-Purpose Organic Fertilizer!